Just wanted to announce the arrival of Dylan Andrew Caspar on 12th March 2011. Welcome to the family little man, we're going to have a great time. Enjoying a few weeks of paternity leave and developing the thousand yard stare of sleepless parenthood. Wouldn't miss it for the world. The guy you really want to watch is right at the very end. He's superb, a star of the future. Subtleties of the Slate from Inspiration Studios on Vimeo. Thoroughly enjoying listening the new Arcade Fire album and spent an hour last night looking through the links of their "enhanced" version. There are youtube videos of various musicians, essays by George Orwell, articles about town planning (the suburbs) and a fair share of internet oddness. It's an insight into the kind of ideas that have influenced the music and it's a bit of fun, a mystery tour. It's been a very strange summer, some good news, a really difficult time, joy and madness. I've dashed about like a mad thing, making sure all the plates in my life keep on spinning at the top of those sticks. I really fancy a day off for myself, without anything to think about, but I'm afraid it just won't happen. Of course, I think this is ok, and it's what I wanted, to be busy. I just didn't bank on how tired I would get. Although not everything is in my control. So, I'm loading up the music and I'm going to get a bit of fresh air, then back to fix up the house and maybe watch a film. A few things I'd like to happen. Like to meet someone who can help me out with the Press. Would like to finish painting the doors white. Would like to get another bike (of course...) Hope that I can have some early nights. This is also the first Soundcloud file i've embedded, I like the way it looks...and sounds. Fun little film of Bill Murray reading poetry to the builders of Poet's House, a new building in Battery Park, New York. The building houses a library, and invites poets and the public to celebrate writing and the diversity of modern poetry. I thought it would make a wonderful addition to dots and spaces, to have included this trailer from a film I very much enjoyed, and which holds a special place in my heart. I learnt so much about what moving pictures could do, and with so much style and beauty, suspense, sophistication and poetry, the sort of film that makes you want to make movies. 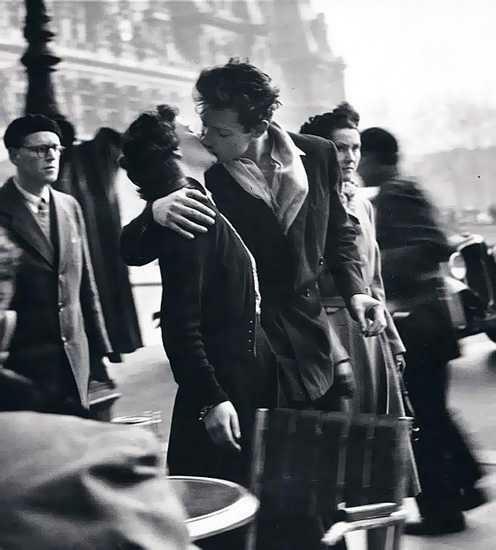 I worry that it's such a classic that it will become a sort of Robert Doisneau poster, so familiar it looses impact. But really, it's vital, alive and bristles with ideas. A template for any film-maker of worth. Separado! from Bait on Vimeo. Super Furry's Gruff Rhys is releasing an album and film with a Brazilian TV repair man called Tony Da Gatorra. Hopefully it'll stream online somewhere, I can't imagine the local Vue is going to show it. Still loving Super Furry Animals after all these years, they still surprise, excite and intrigue me. What a brilliant and creative solution solve bike storage needs. When I think about the contrast between planners in the UK and those in Japan and wonder if such a creative solution to an urban issue would ever be employed here. I also admire the way these inventions are adopted and used. Design is there to offer unity between the different stakeholders, and find common solutions. I think in the UK, the emphasis always falls one way or the other, and users are often left bemused by schemes imposed in an often heavy-handed way. Despite its sophistication, there's a simplicity to this bike park which is worth noting.